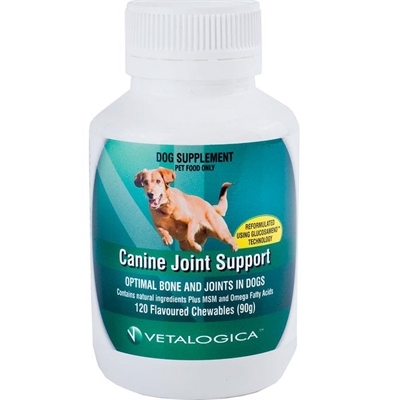 Canine Joint Support – Optimal Bone and Joints in Dogs About 80% of dogs over 8 years old suffer from arthritis or joint stiffness. Numerous factors such as diet, lifestyle, age, breed and injury all contribute to joint function and strength. 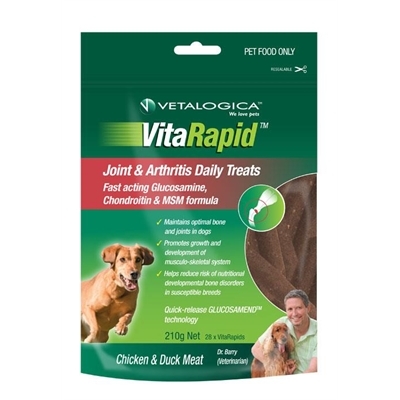 FEATURES AND BENEFITS• Contains natural ingredients plus MSM and omega fatty acids • Specially formulated vitamins and minerals in correct ratios for dogs • Great tasting treat for dogs HOW IT WORKSCanine Joint Support is a particularly important treat in unbalanced diets, which can lead to arthritis and other joint related health issues. 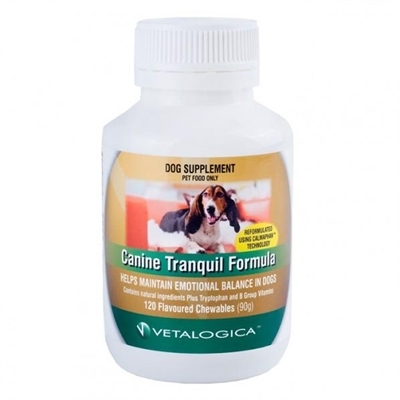 These specially formulated tablets contain essential vitamins and minerals that help reduce the risk of nutritional developmental bone disorders in susceptible breeds. 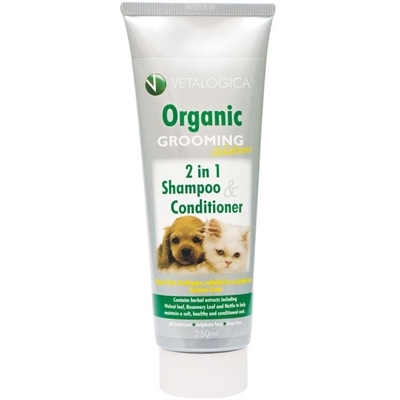 It also promotes optimal growth and development of the musculo-skeletal system.INGREDIENTS Wholegrain Wheat, Poultry Meal, MSM, Poultry Oil, Omega fatty acids, Chicken flavour, vitamins (Vitamin E, Calcium Pantothenate (Vit B5),Riboflavin (Vit B2), Niacin (Vit B3), Vitamin B1, Pyridoxine (Vit B6), Vitamin K, Folic Acid, Cyanocobalamin (Vit B12), Biotin, Vitamin A, Vitamin D), Taurine, minerals (Zinc, Iron, Manganese, Copper, Iodine, Selenium), Antioxidants.Symptoms• Reluctance to walk, climb stairs, jump or play. • Limping • Lameness and joint stiffness• Difficulty rising from a resting position • Personality change and changes in barking or meowing.